We are no longer accepting applications at this time. If you would like to be put on the waiting list or want to know more about being a Docent at the Folger, please email Kate Long at klong@folger.edu. Working with students during festivals, workshops, and programs. Planning and supporting community events such as Shakespeare’s Birthday. Conducting workshops at the Folger, schools, and community centers. What qualifications do I need to become a Folger docent? All you need is an interest in the Folger Shakespeare Library and enthusiasm for working with the public, including K-12 students. A passion for Shakespeare is always appreciated, but isn't required. How do I become a Folger docent? Prospective docents should complete the online application. You will then complete a training course that covers the Folger's history, the Library and its collection, Shakespeare and the humanities, and student programs. After training, new docents work with mentors and attend workshops as they develop skills in performing docent roles. What happens when I become a docent? Folger Shakespeare Library docents are asked to provide 75 hours of visitor services to the Library in a year. This can be done in a variety of programs, including leading daily tours of the Folger, working with students in our Shakespeare in Action workshops, and participating in Shakespeare's birthday celebration. Docents are invited to participate in Folger programs and professional development courses. Is being a Folger Docent right for me? enjoy working with children and students and are available on weekdays. 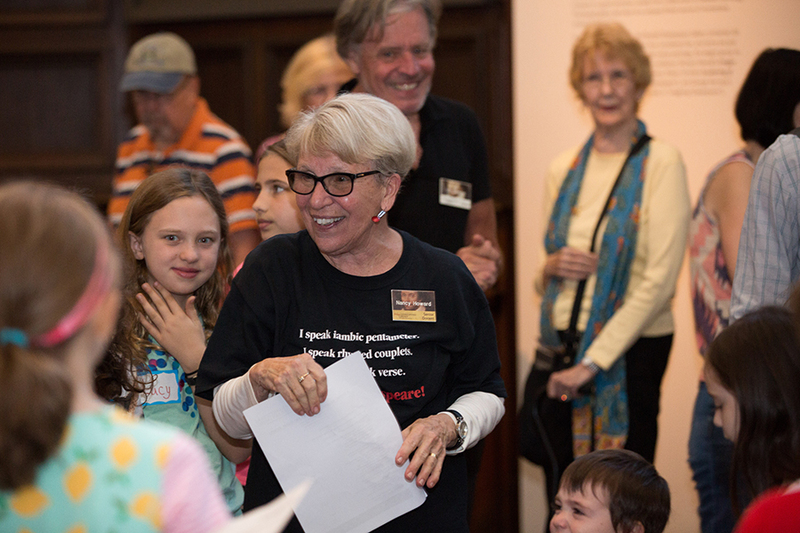 Docents are essential to the success of our family and student programs, leading many of our Shake Up Your Saturday programs and Shakespeare in Action Workshops. want to give tours and are available on the weekends. However, please still apply even if you are unsure if you fit within those preferences. Please fill out the online application. If you have any questions, contact Kate Haase.